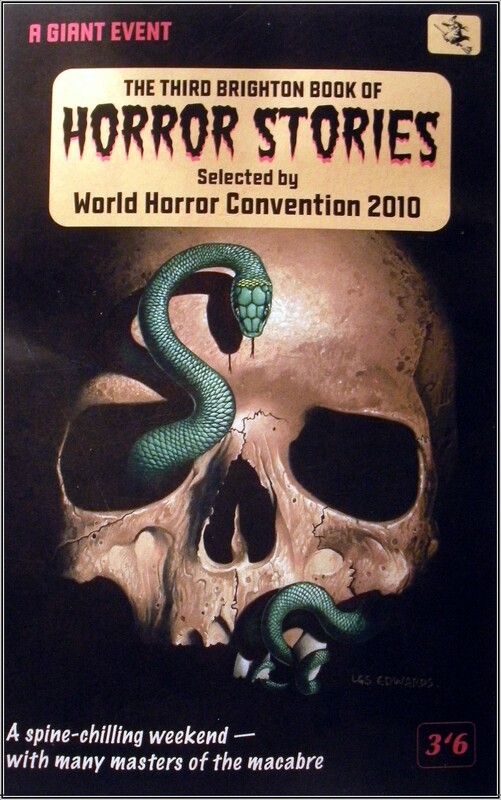 Last weekend the World Horror Convention 2010 came to Brighton – the first time the WHC has ever been held outside of the USA. For four days we found ourselves wandering the twisty turny passages embowelled deep within the Albion Hotel enjoying all things horror and literary. We turned up Thursday afternoon to register and collect our big bag of freebies – including a fantastic souvenir anthology featuring contributions from attending guests of honour and illustrated by some of the genre’s major artists. I was also most pleased with my complimentary Mammoth Book of Zombie Comics. There was a lot to keep us busy throughout the weekend – with a programme packed full of panel discussions, readings, art shows, interviews, parties, launches, workshops and more besides. 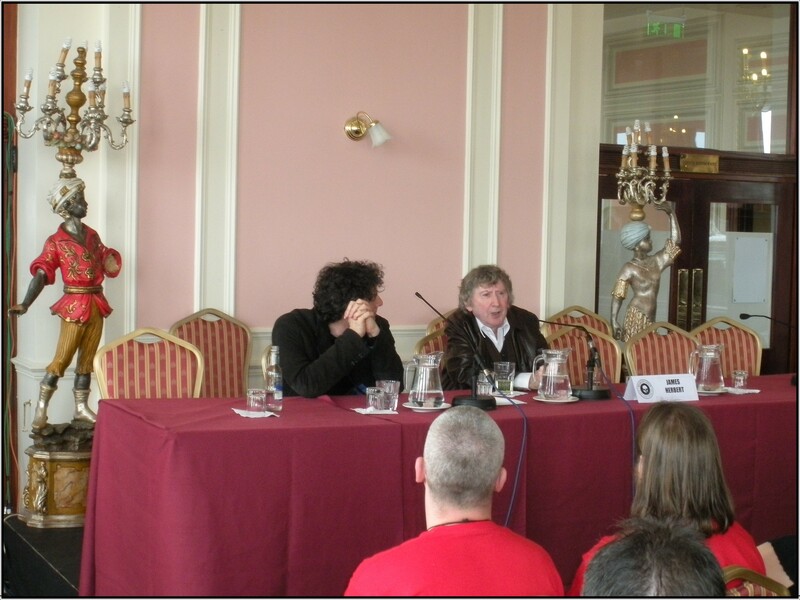 Highlights included Ramsey Campbell’s late night ghost stories and the fabulous James Herbert being interviewed by surprise guest Neil Gaiman. This was a great opportunity to listen and learn from all the great masters of the macabre in attendance, as well as a chance to check out some of the newer writers in horror. As usual though, I bought too many books and wish there had been more time! A spookylicious new tale has just been added to our sister blog Shadowstime. Though feedback on this one has not been too good so far, I love this story. I have dusted her down and looked her over and still can’t bring myself to change a thing. So here she is as she always has been and always will be. I guess Love is blind after all. Originally posted in our shrine of spookiness Shadows Time here is a poem written by Dominic, who now pens his prose over at the Poetry Shelf, so you can go read it there as well. Books and books and books and…. I’ve not been writing too much this past week but that’s because I have been reading loads – as the Gods of all Gifts Secondhand have been smiling down on me with some remarkable finds in my local charity shops. First up was Spiral off Western road, one of my favourite places for a Saturday morning browse. Spread out over three adjoining rooms trailing down Bedford Place and a veritable Santa’s Grotto for knick knacks and furniture, Spiral has an eclectic range of books and magazines – including a vast collection of National Geographics I am slowly making my way through – all stacked in big bookcases along the walls, one of them hiding a beautiful scenic mosaic behind it which is worth a visit to the shop alone. During my last Saturday Spiral excursion I stumbled apon The Masterpieces of Shirley Jackson, published by Raven Books. With an introduction by Donna Tartt, this edition contains The Lottery, The Haunting of Hill House and We Have Always Lived in the Castle. Shirley Jackson and Donna Tartt are two of my favourite authors so the introduction alone was worth the £1 the book cost me. There are some writers you just never ever find in charity shops and Shirley Jackson is one of them. I have just finished We have Always Lived in The Castle and it has affected me deeply – what an amazing story, so funny and sad, bizarre and so true all at the same time. Then on to Oxfam, Western Road for not one, not two but three Ray Bradbury paperbacks, all at a bargain 99p each. Ray Bradbury writes beautifully and I love his prose. Something Wicked This Way Comes is one of my favourite books that I can read and reread time and time again. I’ve not read any of the stuff above but have just started on the short stories compiled in Golden Apples of the Sun – two that stand out for me so far are The Great Wide World Over There and The Fruit at the Bottom of the Bowl. Ok so this isn’t secondhand but at £6.99 is a bargain none the less. Sandpiper specialise in remainder and bargain books with loads of those big coffee table type tomes, so fun to flick through on rainy afternoons, choc full of photos of anything and everything from arty sailors to modern architecture and antique charm bracelets to Andalusian equines. They also stock a wide range of books in specialist subjects and are always worth a browse. I’ve not seen this one much cheaper than £20 secondhand so to find it new for £6.99 is a treat indeed. They still have copies in stock last time I looked so get there quick if you want one. Though HP Lovecraft is another one of my favourite authors and was a prolific letter writer, I’ve avoided reading much of his personal correspondence as the less you know about your heroes the better I think. But since being given his biography for Christmas my curiousity has been piqued; a lot of people who know much better than I do rate his life as having been a pretty tragic one whereas it didn’t sound too bad at all to me. Seems he enjoyed a sheltered, secluded life living off the missus and a small family inheritence, fuelled by strong cheese and coffee, free from the vicissitudes of regular employment – an introverts dream no less! Maybe learning more about his life in his own words will add insight so I am looking forward to tackling this selection of his letters and essays, some of which have never been published before. Just a couple of doors away from Sandpiper is another Oxfam, this one selling nothing but books and records and guaranteed to have something worth buying, though their prices can be a little steep – but what the hey, it’s all for charidee. I spotted this – The Werewolf of Paris by Guy Endore and, though I didn’t know anything about this book or the writer, I have a thing for pictures of teeth so I had to buy it just for the cover – even though it was kind of pricey at £1.99. One thing I love about secondhand books is the pieces of paper you find in them and there is a library type slip glued into the inside cover of this one from a place called Reads + Beads, Sant Bartomeu, Sitges. It appears to be some kind of book rental co-operative and coincidently the last date stamped for this book to be due back is my birthday! Well if that wasn’t enough for a fun filled afternoon shopping what did I spy when made my way to pay at the counter? Holy Guacamole Batman can this be true? For £1.50?! I guess this makes up for the time I spotted Teattro Grottesco in the very same shop tucked away in the foreign language section but decided not to buy it as I had a copy borrowed from the library and hadn’t made up my mind whether I wanted one to keep all to myself or not. So I left it there, foolishly thinking it would be safe for a week or two but alas by the time I realised how fine the stories were it had gone…. Ho Hum – too many books, too little time – I feel a poem coming on. A new story has been added to our sister blog Shadows Time for the month of July. Called Glassed, this started out as an attempt at writing Flash Fiction but at 1,300+ words is still a little long winded. I’ve also added some links to other stuff that’s been good to read lately. So enjoy! The Rejection of Hal – a short story by Liam Carnahan. There is a fantastic new story posted for your delectation over at our sister blog Shadows Time. Called The Rejection of Hal and adding a much needed bit of sci-fi to the mix, it’s written by the very talented Liam Carnahan. Liam is a writer and blogger who is constantly on the move, but currently living in Columbus, OH. He writes fiction and non-fictional personal essays, as well as other stuff that isn’t really called anything at all. He runs the blog invisibleinkling.wordpress.com, a blog for gay writers and student loan payers who like to travel and read. He is hopefully starting up a new blog this Fall called Homosavvy, a culture and politics blog for the sophisticated young gay man. I think his writing is fantastic. Check out his blog for more of his stuff and feel free to contact him at liam.carnahan@gmail.com. Enjoy! A new story has been added to our sister blog, Shadows Time. It’s called Paperchain and it’s about cards – cards with mysterious powers – a sort of cartomancer’s Necronomicon I guess. Where would such cards come from and more importantly where would they lead to? To have a look click HERE. Even more desolate than a seaside town out of season is a seaside town that’s never in season, and the poem below about Severn Beach, once a popular seaside resort – alas no more – captures that sense of forsaken melancholy perfectly. This rather pensive piece of prose comes from our amazing Dominic – who has branched out with a blog of his own so check out: Poetry Shelf for more poems and discussion on all things lyrical. where it earns its keep. lights up the people’s scorn.